The high-end sports car market is funny—you have to pay more to get less. it’s a system that has worked brilliantly for Porsche with their stripped-out RS models, and for Ferrari for their Stradale specials. Except Lamborghini forgot about it. At the top of the auto market, people will pay huge sums to get less car. BMW might have done this better than anyone else when they offered a wonderfully expensive CSL version of their E46 M3. The CSL version (pictured below) didn’t come with a radio or even a bottom lining for its trunk. You just got a big piece of cardboard back there. In any case, Lamborghini had a perfect chance to exploit this less-costs-more model today when they unveiled their Huracan LP580-2. Compared to the regular Huracan LP610-4, power is down 30 hp and weight is down 70-odd pounds (from 3,135 to 3,062 lbs). Most importantly, the car comes without a front differential, going from all-wheel drive to rear-wheel drive. Any car company with half a brain would realize you could market this as a high-performance purist’s special, but Lambo actually made the 580-2 nearly 20,000 euros cheaper than the AWD model. The 610-4 starts at 169,500 euros while the 580-2 only runs you 150,000. I guess I shouldn’t complain. 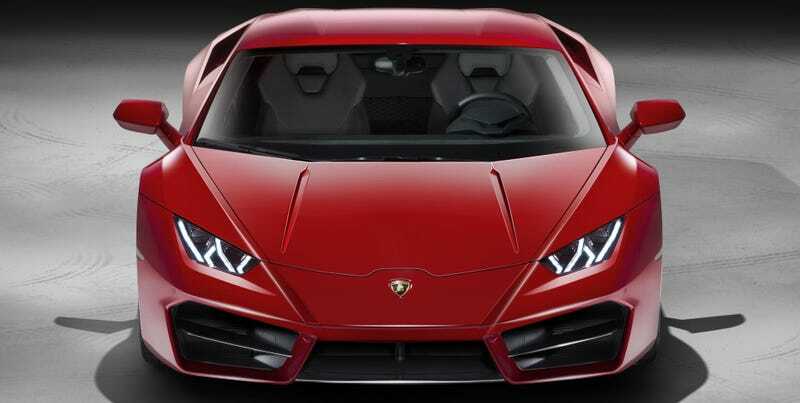 The 580-2 is the model that I would want to buy, so I’m glad it’s less expensive, but Lamborghini ought to realize that they could be following what has worked for their SV and Superleggera models rather than their past Gallardo 550-2. If you can charge more for less, why wouldn’t you?